Kate was 14 and Maggie 11 in 1848, when they started hearing strange rapping in their bedroom. After a while, they realized they could communicate with the dead through the rapping. Through the communication they learnt that the spirit they were talking with had been murdered in the house they lived. Bewildered neighbours came to watch the seances. Rumour about the sisters’ abilities spread, and they are today known as the symbols of modern spiritualism. The rapping evolved into playing of instruments, pulling of hair and slaps in the face and the spirits becoming visible. And one of the spirits that often visited them was Benjamin Franklin. Many famous people met the sisters throughout the years, even the Presidents’ wives. All through this, the girls were put to many tests, often scandalously only in their undergarments. Their much older sister, Leah, was the one who arranged the seances and probably took most of the money as well. But it was the spirits that demanded that they should hold the meetings. Although the girls were famous, their lives were sad. Both had broken hearts after love affairs gone wrong, and they both got addicted to alcohol and drugs. A few years before her death, Maggie confessed that it all had been a hoax and she travelled around showing how they made the raps. It was an interesting read, and I learnt a lot about life in the late 1800s. But somehow I still felt like I couldn’t quite get under the skin of the Fox sister. I’m also glad that the book wasn’t as scary as I thought it would be, and I definitely believe that it was all hoax. I would never have read this book if it weren’t for Ingalill’s biography reading circle which was about alternative lifestyles this round. 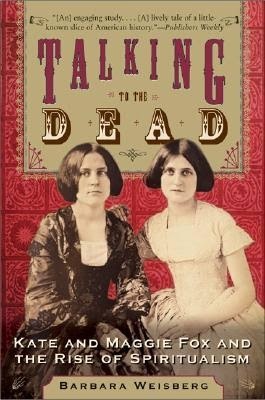 I chose the Fox sisters after listening to a radio programme about spiritualism, and I was curious about how it all started. And now I know.